Attention, all you job hunters out there! There are many reasons why we choose to waste dedicate our talents on a particular profession. It could be convenience (read: "Eh malapit lang sa bahay ko eh! "), the lack of choices (read: "Eh sabi ng tatay ko mag-abogasya ako eh! "), laziness (read: "Eh madali lang eh! "), or even, as cliché as it sounds, love for the job (read: "Eh mahilig ako magbutingting ng mga gamit eh!"). If you ask us though, the biggest factor in choosing a job for many of us remains to be—you guessed it—money. Understandable, to say the least. Last time we checked, we're living in a third world country! 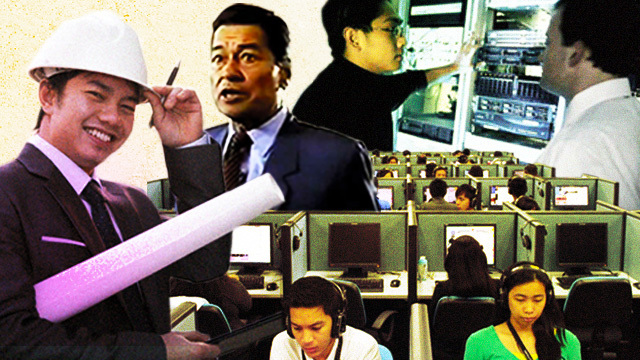 To this we ask: What are the highest paying jobs in the Philippines this year? Don't waste your energy interviewing your working pals; jobstreet.com has done the heavy-liftin' for us! Earlier this year, the giant job search site released its Annual Salary report for 2015 which yielded a bunch of interesting facts, including the very answer to our aforementioned question. Data from the report was then collated and placed into a neat infographic made by finance site imoney.ph for our viewing convenience. Any of you convinced you're in the wrong field? Seriously, though, it sure looks like those in the booming Information Technology industry certainly hit the jackpot, and it doesn't even matter whether they're in an entry-level or managerial post. See? It really pays to know your tech! WATCH: Ballsy Bro Successfully Surfs Using A Freakin' Dirt Bike!